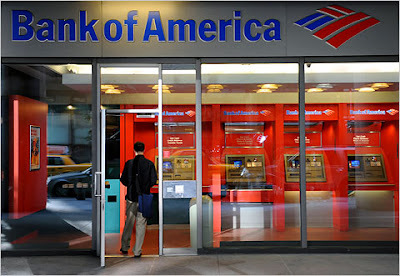 Bank of America Corp. (NYSE: BAC), the largest US bank by assets, is scheduled to release its first-quarter earnings before the opening bell on Friday, April 15, 2011. Analysts, on average, expect the company to report earnings of 28 cents per share on revenue of $27.08 billion. In the year ago period, the company reported earnings of 28 cents cents per share on revenue of $31.97 billion. Bank of America Corporation, a financial holding company, provides a range of banking and nonbanking financial services and products in the United States and internationally. The bank is greatly exposed to consumers with large residential mortgage, home equity, credit card, and consumer loan balances. Its commercial loan book is also large and depends on an improving economy. Bank of America’s acquisition of Merrill Lynch has also made it a significant player in the investment banking world. In the preceding fourth quarter, the Charlotte, North Carolina-based bank's net loss was $7.3 billion, or 77 cents per share, compared with a loss of $2.2 billion, or 26 cents a share, in the year-ago quarter. The latest fourth-quarter results included a non-cash, non-tax deductible goodwill impairment charge of $2 billion applicable to the Home Loans and Insurance segment. Excluding the charge, net income was $756 million or $0.04 per share, compared to a net loss of $194 million or $0.60 per share in the year-ago quarter. Total revenue, net of interest expense, for the quarter decreased to $22.40 billion from $25.08 billion in the same quarter last year. Analysts, on average, expected the company to report earnings of 15 cents per share on revenue of $25.46 billion. Improving business activity has helped banks reduce provisions for credit losses and improve margins on both credit cards and mortgages. Bank of America saw mixed results in 2010 with macroeconomic improvement that allowed the firm (as well as other banks) to reduce reserves for losses, bolstering profits. Banking industry has also benefited from continued credit improvement and return to positive loan growth. The company extended more than $685 billion in credit to individuals, small businesses, nonprofits and large companies in fiscal year 2010, including the extension in $92 billion of credit to small and medium-sized businesses, exceeding the bank's goal of $86 billion. Credit extended in the fourth quarter of 2010 amounting nearly $188 billion, reflects a nearly 4.5 percent increase from same period last year. The company has taken several steps to improve its capital cushion and has positioned itself for profitability. Recently, Bank of America agreed to sell its Balboa Insurance unit to Australia's largest insurer QBE Insurance Group Ltd. for an upfront cash payment of about $700 million in addition to future payments. The transaction, subject to regulatory approvals, is expected to be completed in mid-2011. Bank of America noted that the sale is consistent with its strategy to focus on businesses that directly serve customers and clients around the world while continuing to strengthen its balance sheet. Bank of America said the transaction is expected to result in a one-time after-tax gain and benefit its Tier 1 common capital, including a reduction in goodwill and other intangibles. Also, the company said last month that it's getting out of the reverse mortgage business so it can focus more on its main mortagage operations. "We made the strategic decision to exit the reverse business due to competing demands and priorities that require investments and resources be focused on other key areas of our business," said Doug Jones, consumer sales and institutional mortgage services executive for Bank of America Home Loans. Early in March, Bank of America Corp. Chief Executive Officer Brian Moynihan said he believes the bank has the ability to earn between $35 billion and $40 billion a year in pre-tax earnings when the business normalizes. He also said that the bank has no intentions of making any more acquisitions and will instead look to cut costs and focus on its customers. He also said the bank is focused on slashing costs, not only those from combining its previous mergers but those on its actual businesses. He said the bank was targeting an efficiency ratio, which measures costs as compared to revenue, of 55%. He said the bank expects to get to normalized earnings by focusing on strategy. By business line, he said the bank’s deposit business would be normalized by 2013 while wealth management would be between 2011 and 2013. Card services would take until 2012 or 2013 while home loans would take the longest, likely 2014 or later. On the firm’s business dealing side, its commercial, corporate and investment banks should normalize in 2012 or 2013, he said. Moynihan also said instead the bank was focused on returning “every dollar” in capital to shareholders, through regular dividends, share buybacks and special cash dividends. He said in the year 2013 to 2014 and beyond the bank could be paying out $12 billion in regular dividends and be left with $30 billion more to spend on buybacks and special payouts. However, company has been struggling to win back the confidence of shareholders. Bank of America has been battered more than any of the largest U.S. banks by investors' fears over its exposure to legal challenges and troubled loans in its residential portfolio. Recently, the Federal Reserve rejected Bank of America Corp.'s plan for a "modest increase" in its dividend in the second half of 2011. The Fed told the bank that it could submit a revised capital plan. Bank of America said it will ask permission for a “modest increase” in its common dividend for the second half of 2011 as part of this revised plan. The company's stock currently trades at a forward P/E (fye Dec 31, 2012) of 7.26 and PEG Ratio (5 yr expected) of 1.28. In terms of stock performance, Bank of America shares are down nearly 26 percent over the past year.